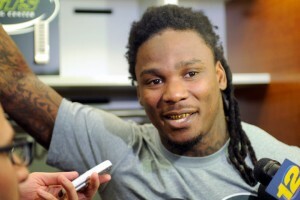 Chris Johnson, the man formerly known as CJ2K, has signed with the Arizona Cardinals. The burning question now on the minds of fantasy owners is: Should we care? Of course, the easy answer is probably not. But since fantasy football is far from simple, it bears looking a bit deeper into the issue. Johnson is obviously not the same player who rushed for 2,006 yards and 14 touchdowns in 2009. Back then, he had some supporters who believed that he was the best running back in the NFL. Most likely this year's version of Chris Johnson will not even be the player who barely topped 1,000 yards in 2013. What he may be able to show, however, is that he has the desire to play hard and contribute. This would probably be enough to make the Cardinals roster and get into the rotation for carries. Chris is not even the best Johnson on the Cardinals. could make a player fantasy relevant. Rookie David Johnson has promise, but he has been held up by a hamstring injury so far this preseason. A rookie who misses reps in the preseason is not going to engender much confidence in his coach, hence the reason that a veteran is being brought in to compete.For almost the entirety of his career, Chris Johnson has been a player who looks for the big play. This often comes at the expense of gaining easy yards. Johnson is known as a back that relies on blazing speed and avoids contact, making him less useful with every passing year as his once elite speed wanes. Last season for the New York Jets, Johnson was able to fill more of a traditional running back role. He cut back on the east to west runs and just headed straight downfield. Despite the improvements that he made over the previous season (ypc went up from 3.9 to 4.3), Johnson was clearly the inferior back to Chris Ivory(who is hardly a superstar himself). This season Johnson will be turning 30, an age at which most running backs have little tread left on the tires. Still, Johnson is being given an opportunity to potentially spell Ellington or fill in for the oft injured back. It seems likely that this arrangement may not last beyond the final cut downs of the preseason. The biggest benefit to the Cardinals may be for Ellington to be able to play alongside Johnson and pick the veteran's brain, as the two have similar styles. In the end the most likely scenario is that Johnson will be dropped from the roster or play third string behind Ellington and David Johnson. If you must have a running back named Johnson on your team, David is probably going to be the way to go. At the moment he is more of a handcuff or a lottery ticket, but that is more than can be said for Chris Johnson. There are too many talented running backs available this season to get excited about a retread like Johnson. Don't be fooled into buying an old name brand, CJ2K is no more.